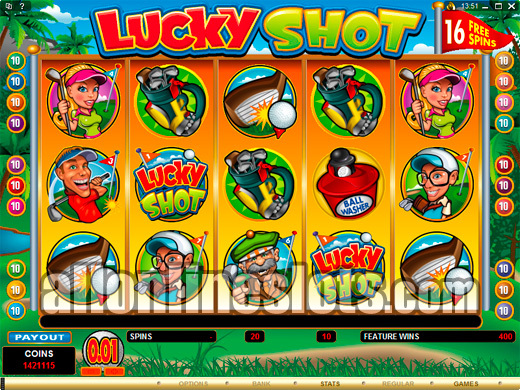 Lucky Shot is a golf theme video slot with 20 lines. It has two bonus features including free spins with wins doubled and a pick a box bonus where you can win up to 300X your bet. Top jackpot on the reels is a very nice 15,000 coins. Golf fans hold on to your hats - this game is for you. 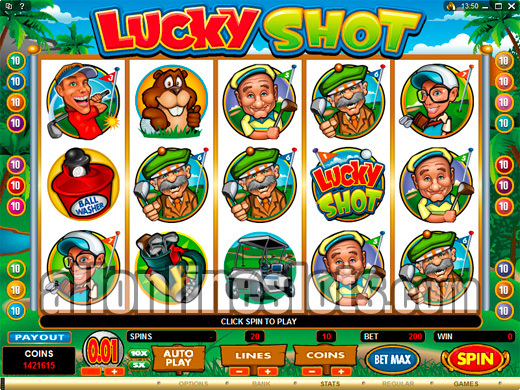 Lucky Shot is a 5 reel, 20 line video slot with a humorous golf theme. It has a big top jackpot of 15,000 coins which when hit at max bet pays a big 300,000 coins. It also has a free spin bonus and a pick a box bonus which makes it very entertaining. The game comes in coin sizes ranging from 1 cent to 50 cents and max bet is 200 coins. This means you can be putting for the jackpot for as little as $2 or as much as $100 per spin. Of course the bigger you bet the higher the potential jackpots. Up to $300,000 can be won on the free spins! On the reels you have a range of golf related symbols including scattered golf carts, five golfers, trophies, clubs, a ball cleaner and a gopher. You also have the Lucky Shot logo which is the highest paying symbol. Get five Lucky Shot logos on any active line and you win the top prize. The scatter pays work a little differently to the norm as they must appear on adjacent reels. 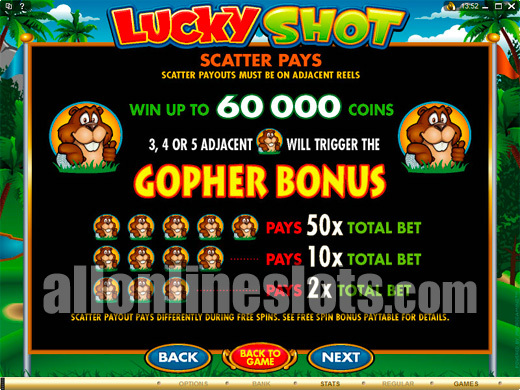 There are two types of scatter symbols on Lucky Shot - the golf cart and the gopher. Getting three four or five golf carts awards 9 or 18 free spins with all wins doubled. The free spins cannot be re-triggered as the golf carts simply become scatter pays during the free spins. To make up for this there are some bonus pays on the free games. 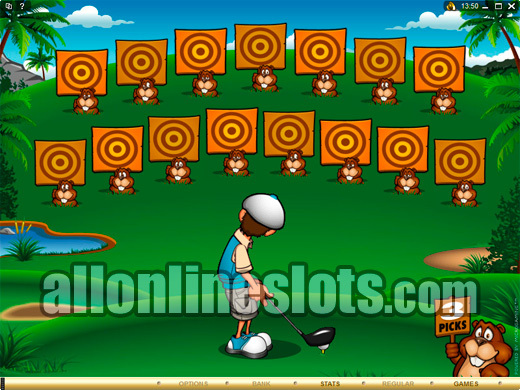 During the spins getting five gophers or five golf carts pays 200 times your bet or 40,000 coins at max bet. The gophers are the ticket to the second screen bonus. Get three or more and you move on to the animated bonus game. Here you have a range of gophers on the fairway and you get to have a shot at three of them. Each hit awards a bonus prize. 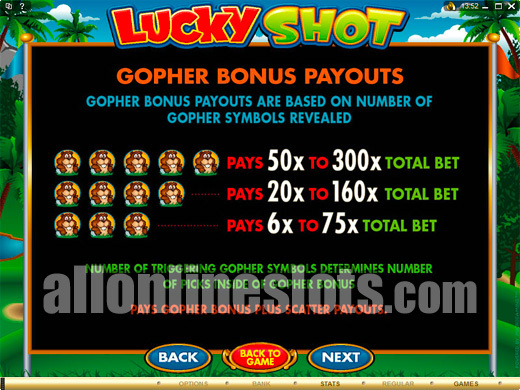 The amount you win is based on the amount of gophers you had to trigger the bonus. Up to 300X your bet can be won (Screenshot). Lucky Shot will definitely be a popular pick for golf fans especially on a rainy day. even if you are not a golf fan the game offers some big prizes and enough bonus features to keep most video slot fans happy.